During your vacation, explore a string of lovely South Walton beach towns on highway 30A — just east of Hilton Sandestin Beach Golf Resort & Spa. 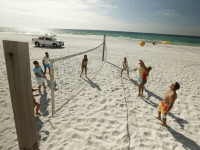 There are 16 towns in total: Miramar Beach, Seascape, Sandestin, Dune Allen, Gulf Place, Santa Rosa Beach, Blue Mountain, Grayton Beach, WaterColor, Seaside, Seagrove, WaterSound, Seacrest, Alys Beach, Rosemary Beach and Inlet Beach. Each has its own unique personality and all offer great things to see and do. First stop, Grayton. 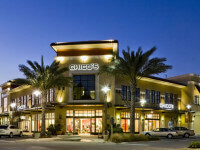 This laid-back South Walton beach community (just 20 minutes from the resort!) 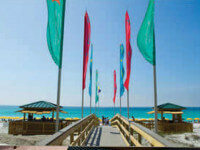 was established in the late 19th century, decades before any of 30A’s planned beach communities were dreamed up. Now, it’s a charming mix of historic beach cottages, unforgettable restaurants and great places to shop and socialize. You’ll want to give yourself time to look around Grayton’s boutiques and galleries. Standouts include Monet Monet, featuring Nicole Paloma’s smart apparel, and Allison Craft Designs, which showcases the artists tasteful leather and pearl jewelry. And don’t miss The Red Bar, known up and down 30A for its delicious food, funky décor and great jazz and blues band. Seaside’s picket-fence perfection hit the big screen in the 1998 movie “The Truman Show,” but the town’s New Urbanist design has had visitors swooning since it was founded in 1979. One-of-a kind shopping can be found at beachside fashion bazaar Perspicasity and the town’s many other boutiques. For the hungry, the popular Bud & Alleys and Great Southern Café always satisfy, and for lighter fare there’s Modica Market, the organic juice bar Raw & Juicy and the gourmet food trucks lining Seaside’s entrance. Visitors who want to add some culture to their trip can wander the galleries at the Ruskin Place Artist Colony, take in a play at the Seaside Repertory Theatre or attend a concert at the town green. 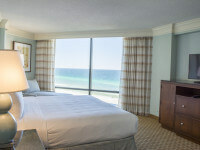 Seaside is 25 minutes from Hilton Sandestin Beach. Alys Beach (pronounced “Alice”) is 30A’s most visually stunning community and about 45 minutes from the resort. Visitors love the town’s white stucco, Bermuda-inspired buildings and public spaces. Fonville Press is a magical spot to sip coffee or wine and enjoy light fare, while the popular George’s restaurant lets you “behave or misbehave,” depending on which side of the menu you order from. If you happen to be visiting in mid- to late May, Alys Beach lights up at night during Digital Graffiti, when artists use the latest digital technologies to project their work on the town’s iconic white buildings. And in February, Alys Beach hosts the annual 30A Wine Festival. A few minutes past Alys Beach at the east end of 30A, Rosemary Beach adds Southern hospitality to the charm of a Mediterranean village. The focus for day-trippers is the Merchants of Rosemary Beach, a collection of upscale shops, galleries and restaurants. Shop fashion, books and gifts or peruse the art galleries and indulge yourself at the day spa. Amavida Coffee and restaurants like La Crema, Restaurant Paradis and Edward’s always receive rave reviews. The town’s yearly calendar includes Rosemary Beach Uncorked, its annual wine festival, as well as frequent farmer’s markets, crafts markets, outdoor concerts and performances. Minutes from 30A, our hotel offers visitors easy access to charming South Walton beach towns!